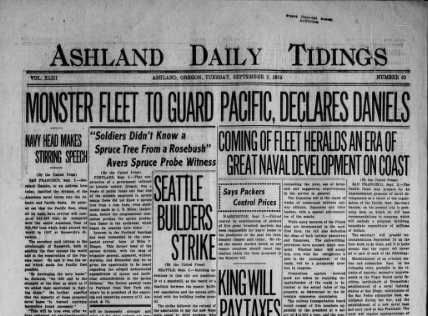 Sheila Rabun on digitizing Oregon's newspaper history. You really begin to appreciate the time-consuming work of digitizing old media when you peruse the Oregon Digital Newspaper Program. With a few key words, you can search 150 years of newspapers from across Oregon. So much is there, from the top news stories to the funnies to ads of the day (1921 Studebaker Light-Six, $1750). University of Oregon Libraries set up the ODNP, and will get an Oregon Heritage Excellence Award for it later this week. Digital Project Manager Sheila Rabun joins us with the story of the archive. Floyd McKay reminisces about glory days in Oregon. Newcomers to Oregon can scarcely believe the stories of a few decades ago, a time when Republicans dominated state politics and fought for landmark environmental protections. All true, and the central focus of Floyd McKay's book Reporting The Oregon Story. McKay, a newspaper and TV reporter for decades, focuses on the period from 1964 to 1986, a time when Tom McCall and Bob Straub moved up the ranks to the governor's office, facing each other in several elections. Accomplishments of the time include beach protections, bottle deposits, and land-use regulations, among many others.